Today is Christ the King Day. It’s kind of like News Year’s Eve for the church. Next week a new church year begins with the season of Advent. A time when we wait with hope-filled anticipation of the coming of our savior in a little baby. I’ve been blessed this year with several opportunities to travel and serve in the church in some pretty incredible ways and in some pretty incredible places. One such place came to mind this week. It’s about 90 degrees in the shade with little to no breeze in the air. My mission team brother in Christ Tim and I have just been given a new task. We are in the Gitsemane community of Los Buenos, El Salvador helping three families build new homes through Thrivent Financial for Lutherans’ Builds program and Habitat for Humanity in El Salvador. The homes we are building are extremely modest by our standards – the entire house would easily fit inside nearly every one of our living rooms. But they are miraculous homes of unimaginable size and beauty and safety to Salvadorian families who have lived most of their lives in homes with dirt floors and corrugated steel walls and roofs made from plastic sheeting. So Tim and I had work to do. Our assignment was to relocate three dump truck loads of dirt with a shovel and a wheelbarrow. The trick in this assignment was that the two loads of dirt that we could see on top of the pile were NOT the dirt that we needed to move. What we needed to move was the dirt on the bottom of the pile. Obviously, in order to get to the bottom of the pile, the dirt that we needed, we first had to move the dirt on the top of the pile, the dirt that we didn’t need. I kept thinking, I’ve never moved a pile of dirt from one location to the next in my own yard – why in the world did I think this would make any more sense in northern El Salvador!? I was beginning to think that the entire enterprise that Tim and I were undertaking was quite possibly the most ridiculous thing I had ever done. And then I heard four little words. These four little words are the signature phrase of the Evangelical Lutheran Church in America. I think they’re much more than just a catchy slogan that we can put on our letterhead. For me, they are quickly becoming a missional calling for every person in the United States who calls a congregation of the ELCA their church home. As Tim and I continued to dig, my frustration grew. 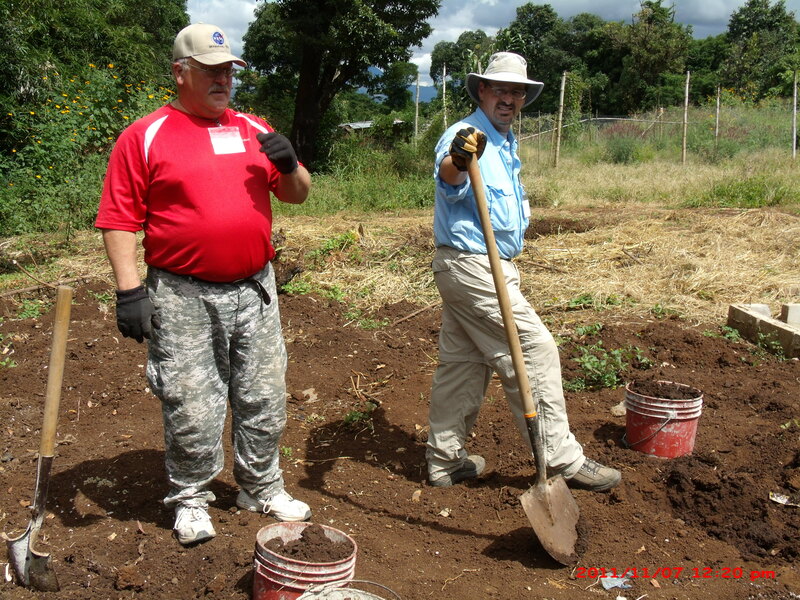 Come on El Salvador – haven’t you heard of this really cool invention called a Bobcat that is a whole lot better at moving dirt that Tim and me? With each shovel of dirt, frustration grew. One shovel full of dirt, two shovel fulls of dirt, 180 shovel fulls of dirt. See Christ – are you kidding me? This was hard work that we were doing that didn’t make much sense in the first place, much less include Jesus in any way. And then out of the blue, we were joined by one of our Salvadoran brothers, one of the masons at this job sight. He stopped by to see how we were doing. To say hi and grab a shovel and work alongside us for a little while. I saw Christ in my neighbor. In a place that I least expected. I saw Christ in a neighbor that walked beside me and pointed clearly to the importance of the work that we were doing in this little village. And when our week of work concluded, these neighbors sent me home with a very special gift for being a pastor to them during the week. The stole I’m wearing today. It’s a gift that will help me remember the love of God that I experienced in a most unexpected place. In a most unexpected face. How do you see Christ in your neighbor? And how do you respond when you do? The images that you’ve been seeing are just some of the people and places where I’ve seen Christ recently. In today’s gospel text, I think Jesus is promising us something. Promising you and me, who are walking the earth centuries after Jesus walked, that we have face-to-face encounters with Jesus each and every day. When you see neighbors at school, or work, or church, or in a community halfway around the world – do you see Christ in their faces? As you complete your financial promise card to support the mission and ministry that God is calling Good Shepherd Lutheran Church to live out in 2012, will your see Christ in that financial promise? A few months ago, Wendy and I were blessed to walk the same streets and garden paths that Saint Francis of Assisi walked nearly 800 years ago. Saint Francis gave up a significant inheritance from his family in order to serve the poor. I pray that the blessing I offer in the spirit of Saint Francis blesses you and me as we seek to see Christ in our neighbor. Receive this blessing today. One last thing. Tim and I did get that dirt moved. And a beautiful tile floor is being installed this week in that home. Right on top of the dirt that we moved. That pile of dirt that we moved made this week’s flooring installation possible. This entry was posted on Tuesday, November 22nd, 2011 at 2:58 am	and posted in Recent Sermons. You can follow any responses to this entry through the RSS 2.0 feed. Thirsty For Jesus? | God's Grace, ftw. Very cool Lois! Thanks for sharing.